I, too, was going to suggest that it looked abstract, especially with that color scheme. That's a happy looking tulip with it's bright red color and yellow accent. They have been so beautiful this year and it's nice that they are blooming for much longer than usual. Lovely! Tulips are one of my favourites! You are so amazing! I adore this photo. I also like the "abstract-ness" of this photo. Definitely not the stereotypical tulip shot! I love it - the colors are just gorgeous!! What an amazing shot, if I hadn't read "tulip" it may have taken me a while to figure out what it was! Thanks for stopping by in Normandy today. As always, great shots with lots of color. Wow, amazing! I have a poppy in the yard now that looks just like that on the inside too. odd! 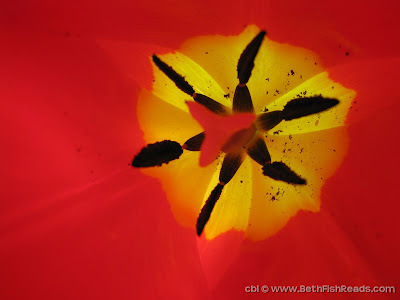 I recognize this because I was just peering down into one of my red tulips yesterday. An amazing maze. I didn't read the title so it took me a minute to figure out what this was. Another beautiful picture. What a great eye you have. You must have the world's greatest camera, and with an eye like that...well the images you capture are just beautiful! I am hoping that you frame some of these and put them on your wall. That's gorgeous!! It's so close up at first I wsn't sure what it was. Very cool. It looks computer generated. What a fine macro shot of a flower this is! «Louis» thanks you for visiting his Wordless Wednesday post. The color is stunning! So vibrant. Oh, I love this. It looks like 70's modern art. I actually thought this was a painting when I saw it. Fantastic!Thanks for turning off Word verification. It's the most annoying thing, ever. Especially now that it seems like 2 endless words that are so hard to read. I find myself commenting less on blogs that have it.